The young heroine in this picture book is bored. She has asked her whole family if they will play with her, but they're all too busy, so she stomps up to her room for a good sulk. In her room she spots a bright red crayon on the floor. The crayon is her ticket to adventure, as she uses it to draw a door, a boat, a balloon, a key, and finally a wheel. Picture book fans will recognize the concept from Harold and the Purple Crayon, but Journey has a more complex story, with a happier ending. Journey is a wordless picture book. That means that the illustrations need to tell the story. It's no surprise then that the artwork is incredibly rich. Most of the pages are a riot of detail, from the distant waving guards in a city of towers to the cogs and gears inside a sky-borne paddle steamer. When a central plot point occurs, the background is suddenly white and we focus on our heroine. Meanwhile, that red crayon shines like a beacon on every page. 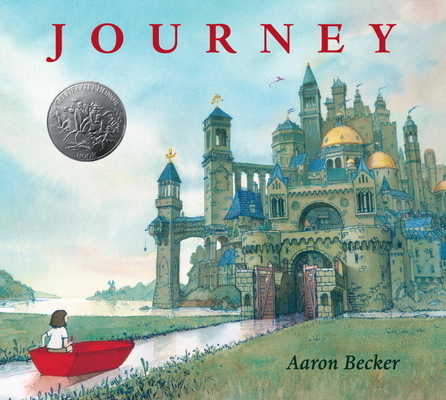 Journey is an exceptionally beautiful treasure of a book for anyone aged 3-5.